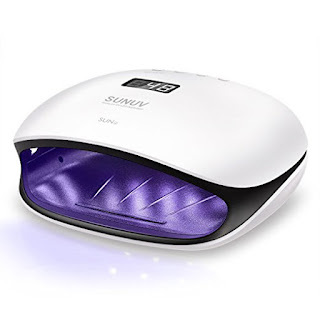 Right now you can snag this SUNUV 48W UV LED Nail Dryer for Gels Polish With Sensor for $39.72 (Retail $79.99). Valid 5/2. 1.PROFESSIONAL ALL-IN-ONE NAIL LAMP: SUN4 is closed and one-piece designed with 36 pcs UVLED combined light beads makes it works well with ALL types of UV gel and LED gel nail polish,e.g.Base Coat, Top Coat, Color Gel, Hard Gels, Builder, acrylic, sculpture gel, gem glue etc.. No brand requirements though. 2.SMART NAIL LAMP 2.0: SUNUV have made the nail lamp smart and user-friendly -- auto-sensor for on/off without pressing any keys, 99S LOW HEAT MODE for the comfortable builder/hard gel curing, Double Power key for 2X faster curing, large LCD screen to show curing time and more. 3.IDEAL CHOICE FOR BOTH SALON AND HOME: bigger body designed for curing 5 fingernails or toenails. Compact and close customization can effectively prevent light leakage to protect the eyes. 36 pieces long-lasting 50000hrs lifetime LED beads are evenly distributed inside, it would helps to uniformly cure gel nail polish. 4.ADVANCED CURING TECHNOLOGY: Double Power button offers cure speeds up to twice as fast as standard UV LED nail lamp—a full cure takes just 30% of traditional nail lamp. 5.4 TIMER WITH TIME MEMORY FUNCTION: SUN4 have 10s/30s/60s timer and 99s LOW HEAT MODE/Double Power setting for better cure the gel polish according to the DIY needs and gel polish's requirements.